So as you can see from my post yesterday I am sick. It seems like it came on all of a sudden :( Sunday night I had a sore throat, then I didn’t sleep well at all and woke up with an extremely stuffy nose. I drank 1 1/2 liters of 100% orange juice yesterday and slept from 5 pm to 10 pm then woke up and had some ramen (closest thing I had to soup haha) and more oj and went back to sleep til this morning. I woke up pretty early this morning since I had slept from 5-10 before going to sleep at 11:30, but I actually feel quite awake today. I do not feel any less sick however. Ugh. Maybe I’ll get a sick day outta the deal, but not today because I teach my first Eikaiwa class tonight! I’m looking forward to meeting new people, and hopefully I can put on a Genki face despite the fact that I am sick. Since asking me to do the class, the community center has since asked another teacher that speaks Japanese to join the first class to make sure things run smoothly. I was taken back at first because they never told me, and if he hadn’t told me I would have shown up to an extra teacher being there. Despite the fact that they sorta went behind my back, it will probably be a good thing to have him there tonight, especially cuz when I had my first meeting with them I got about 3 sentences of information translated to me. But of course it makes me more nervous and makes me feel like I am being “checked up on” and this is only being compounded by the fact that I feel icky and really just want to be in bed until I feel better! I did have a good weekend this past weekend. 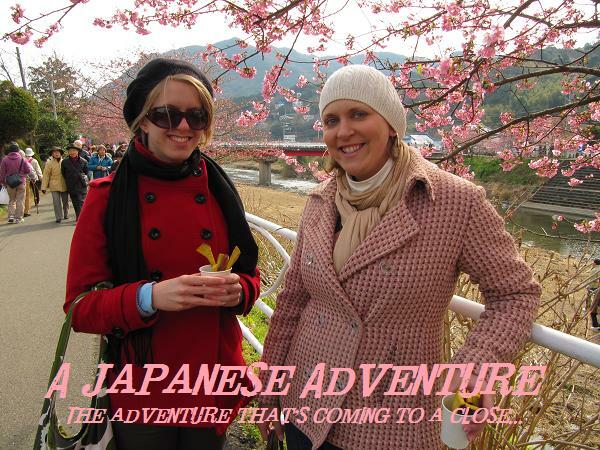 Jenny came to visit me in Friday and we were able to go out in Fuji with a few other English teachers in the area. We got some dinner and socialized for awhile and then Jenny and I headed to the peninsula for Saturday. I got to watch a high school team that were national champions in taiko. I was quite tired from the night before so the beat of the drums was putting me to sleep for awhile, but it was really cool when I was awake enough to appreciate it! Then Saturday night we ate at a Mexican restaurant, which of course, was divine! I think Mexican food is becoming my new comfort food – makes everything in life feel more normal. Sunday we went on a hike along the Nanadaru Waterfalls – a path with seven waterfalls out in the middle of the Izu peninsula near where I live. This coming weekend is Hiroshima, hopefully I am feeling better by then! I hope things at home are going well and that this post wasn’t too dry toast. Love you all!